Okay… well, that was horrible. Goodness, I hate feeling like this. You know, that feeling of complete disappointment? I really, really wanted to like this one. 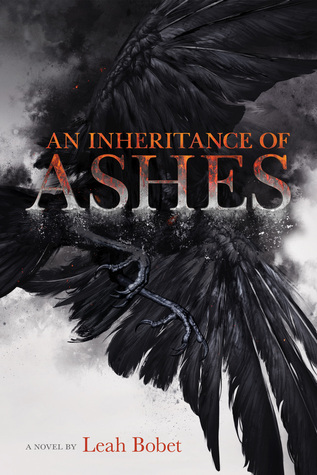 Everything I saw about it was fantastic, the reviews were wonderful, the cover is gorgeous, the synopsis intriguing – and yet, An Inheritance of Ashes fell completely flat. I don’t know what it was about the book that finally made me realize how much I was starting to loathe the thing. I was so confused about it all. I had no idea what the setting was, for one thing. This was supposed to be a fantasy, but the only thing that felt like fantasy was the introduction of the Twisted Things. Otherwise, I thought this book was some sort of historical fiction. The mentality of the characters, the setting, the clothing, the way they interacted – all of it screamed historical fiction after the Civil War. Don’t get me started on the characters, they were a mess. I didn’t understand any of what was going on. I couldn’t see any motivation, any feelings, nada. I was really upset, actually. This book started off really strong. I loved the opening chapter, I don’t know what it was about it – but it completely drew me in. It went downhill from there, and, frankly, it hurt to read. I will be completely honest with all of you, I did not finish this book. I got through twelve chapters of it, and at that point I decided enough was enough. I had hoped it would get better, but nope. Come on people! Twelve chapters is about half way through the novel, and it all stayed the same. There was no kick, no push, nothing to keep me interested. While reading this, I had a lot of questions and doubts and none were answered. I was expecting something beautiful, something revolutionary that would make us second guess war – but what I got was a book that made me want to go to war with the publisher and wonder how the hell they could put this out in the world with good faith. Overall, I would recommend you skip this book and use your wonderful time for something else, something worth it. For a book with a lot of potential, An Inheritance of Ashes fell so short it makes me look tall. (I’m barely five foot, if you’re wondering.) Don’t waste your time on this, trust me, it isn’t worth the effort. Also, am I the only one who things the title is eerily similar to An Ember in the Ashes?